"So what's it about?" "Leaving a mark, getting respect." A trailer has debuted for a new indie drama titled Quest, a story about a young kid who loves tagging and graffiti, and meets a friend who might help guide him in life. Young actor Gregory Kasyan stars as Mills, a 12 year old graffiti addict who is losing faith in integrity. His home life is mess with an abusive dad and a mom who doesn't believe him. His school life isn't much better. A sympathetic teacher and champion of at risk kids enters his life. Co-starring Dash Mihok, Keith Stanfield, Lou Diamond Phillips, Betsy Brandt, Sepideh Moafi, Marlyne Barrett, Allen Maldonado, and Karen Kahn. This is premiering at a few film festivals this fall, but otherwise hasn't made much of an impact yet. Looks like it could be a cool low-key indie about the art of graffiti. Check it out. Based on a true story, "Mills" is an abused 12 year old graffiti addict who is losing faith in integrity. Tim Moellering is a humble middle school teacher and football coach in Berkeley California who believes that there is no such thing as a bad kid, only a bad situation. The two form an uneasy friendship when Tim recognizes Mills unhealthy behavior is merely a cry for help. Keeping his promise, Tim is willing to sacrifice his reputation, job and relationships in order win the child’s trust. But Mills cannot trust until he learns to trust his struggle first. 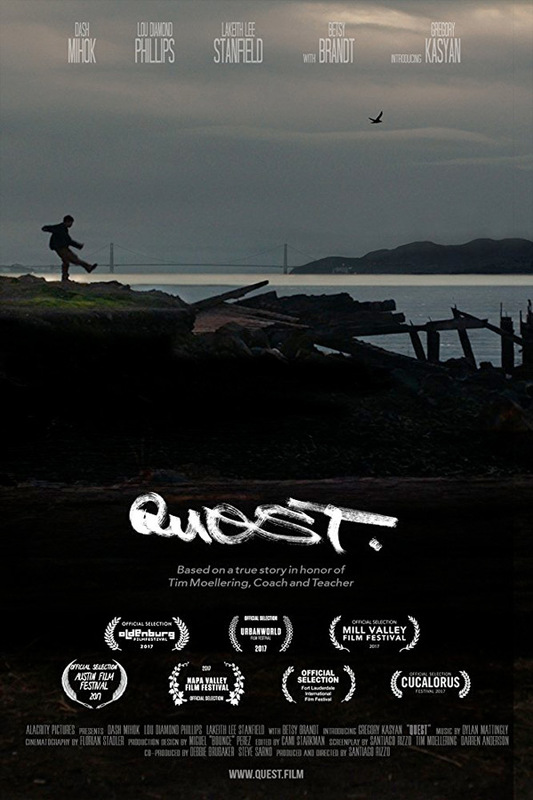 Quest is directed by first-time filmmaker Santiago Rizzo based out of San Francisco. The screenplay is written by Santiago Rizzo and Darren Anderson. The film will premiere at the Mill Valley Film Festival and Austin Film Festival this month. It has no official release date set yet. Curious?